The No. 24 Pitt wrestling team got one experienced starter back Saturday against North Carolina: senior 149-pounder Mikey Racciato. But junior Dom Forys — the team’s top-ranked wrestler — missed his third straight match, and it was too much for the team to overcome. 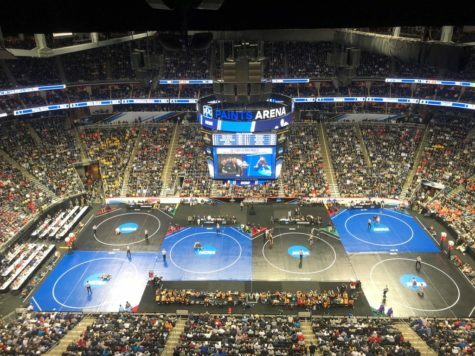 Pitt junior Brendan Price, Forys’ inexperienced replacement at 133 pounds, lost a 21-9 major decision in a match Forys would have been an overwhelming favorite to win. The four-point major decision wound up being the difference in the meet, as the UNC Tar Heels (6-5 overall, 1-2 ACC) knocked off the Panthers (8-4 overall, 0-2 ACC) at the Fitzgerald Field House, 20-16. 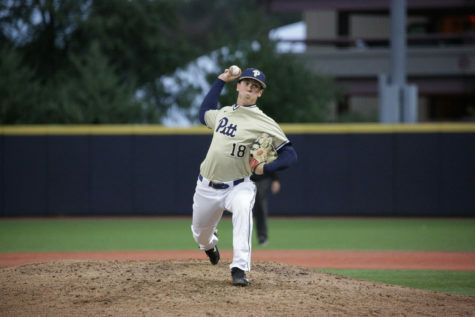 Pitt has stumbled to a pair of disappointing losses to start conference play while dealing with a sudden and unexplained midseason coaching change. 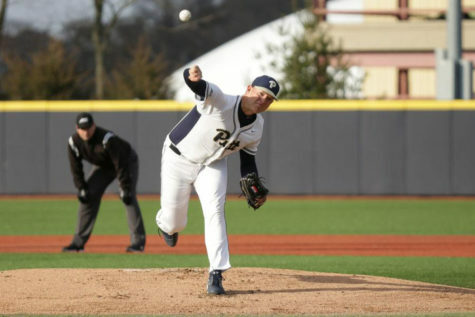 Jason Peters was removed from his position as Pitt’s head coach following an incident during the team’s trip to Evanston, Illinois, over winter break. At least three wrestlers invited women from Backpage.com to their hotel room and later called the police for a report of stolen money. 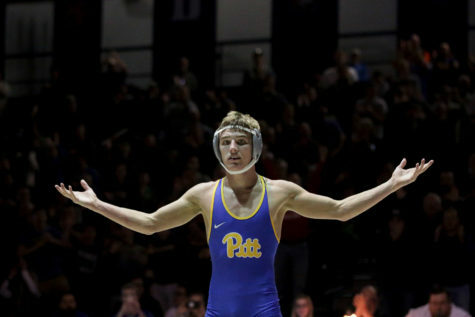 Despite the removal of Peters, and the absence of at least two wrestlers in meets since winter break, Pitt has refused to comment on whether anyone was suspended and what Peters’ involvement was. “Any disciplinary actions that have taken place are a private issue between the staff and student-athletes,” Pitt Athletics Spokesperson E.J. Borghetti told The Pitt News Sunday. 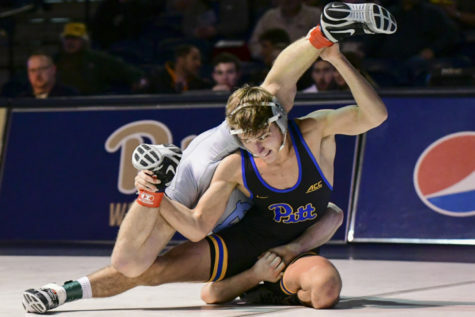 Racciato didn’t compete at the Pitt Duals on Jan. 14, or the Panthers’ matches vs. Virginia Tech and Virginia Military Institute last weekend, while Forys missed both matches last weekend along with Saturday night’s dual meet against UNC. “[Mikey] had a little shoulder injury that he suffered at Midlands. 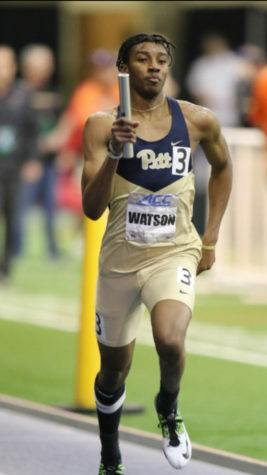 He had to withdraw out of the Midlands tournament,” Pitt acting co-head coach Matt Kocher said after Saturday’s meet. Kocher said Forys, the No. 8 133-pounder in the nation, has also been hampered by an injury. 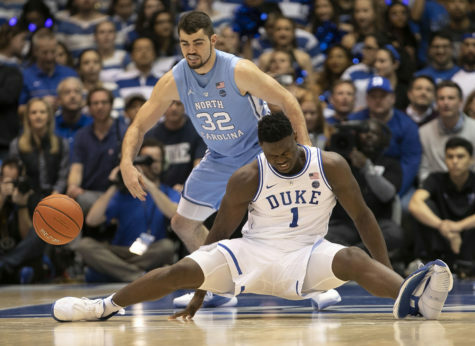 “[Forys] has had a high-ankle sprain, we’ve been dealing with some things, so it’s about getting him ready for March,” Kocher said. If both wrestlers were taken out for injuries, as Kocher suggests, only Peters has been penalized for what happened in Evanston. 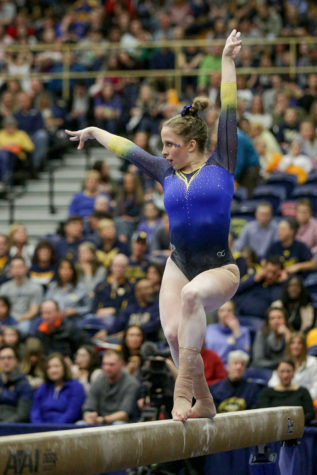 Kocher and Drew Headlee have taken over in Peters’ absence, and were acting as co-coaches for the third meet Saturday night. The teams split the 10 bouts Saturday with five wins apiece, but the Tar Heels picked up two major decision victories and a pin while the Panthers only managed one major decision. Pitt 125-pound sophomore LJ Bentley started off the meet with a takedown as soon as the whistle blew for the first period. UNC’s James Szymanski would escape, but neither wrestler could generate any more offense in the period. Bentley scored an escape early in the second period then added another takedown to take a 5-1 lead. After Szymanski fought his way back to his feet, Bentley added one more takedown to claim a 7-2 lead into the third, and he wound up with a 9-3 decision victory. Price then took the mat for his first match since the 2014-2015 season in place of Forys against Tar Heels 133-pounder Nicholas Lirette. The two put on an exciting show in the first period, as Price countered two Lirette takedowns with a pair of reversals to the delight of the Panthers’ bench. Lirette led 7-5 after the first period, then turned up the pressure in the next two periods to rack up a 21-9 major decision. Despite the loss, Kocher was proud of the way Price competed in his 2017 debut. Pitt sophomore Robert Lee then faced one of two top-10 wrestlers for the Tar Heels — returning All-American and No. 5-ranked 141-pounder Joey Ward. Ward built a comfortable 6-1 lead in the first period with a takedown and four near fall points, then cruised the rest of the way to a 10-1 major decision. Racciato then returned at 149 pounds to face UNC’s Troy Heilmann. The senior used some creative defense early in the bout to take a 5-1 lead while avoiding several takedowns by rolling into top position as soon as he hit the mat. But he appeared to lose steam in the later stages of the match, giving up several easy takedowns and dropping a 10-7 decision to Heilmann. At 157 pounds, Panthers redshirt freshman Taleb Rahmani brought the crowd to life against Tar Heels redshirt senior Joey Moon. With both wrestlers fighting for underhooks late in the first period, Rahmani pulled off a six-point move from an almost impossible position. He reached back and locked up both of Moon’s arms, which were wrapped around his back in a bear hug, then flipped him over onto his back. Rahmani had to settle for a takedown and four-point near fall to take an 8-1 lead. He let up a takedown to Moon in the third period, but held on for an 8-4 decision win. The 165-pound match featured Pitt’s only ranked wrestler in the lineup, No. 14 TeShan Campbell. Campbell started slow, but picked things up midway through the first period with a powerful double-leg takedown and a four-point tilt. 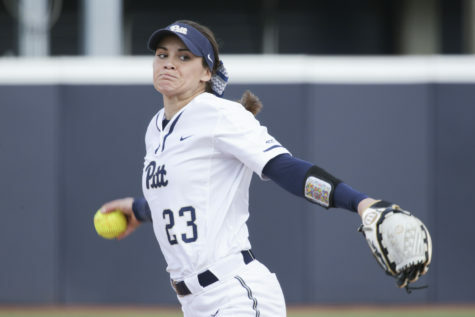 Campbell secured a 9-1 major decision to bring the Panthers back within one point at 11-10, but No. 6 Ethan Ramos responded in dominating fashion at 174 pounds for UNC. Ramos built a 7-0 lead over Pitt sophomore Cam Jacobson before finishing with a second-period pin to put the Tar Heels up 17-10 with three matches to go. Sophomore Zach Bruce kept the Panthers’ hopes alive with a 10-3 decision at 184 pounds, but he fell one point short of picking up a crucial major decision. Senior John Rizzo then lost a 10-4 decision to UNC’s Danny Chaid at 197 pounds to clinch the victory for the Tar Heels. Pitt’s No. 15 heavyweight Ryan Solomon picked up a hard-fought 4-3 decision win in overtime in the final match of the night, but UNC held on for the 20-16 match win. Solomon has picked up a couple of match-clinching victories earlier in the season, but he said his approach didn’t change Saturday even though the meet was already decided. “It’s the same mindset every time. Even if the match is on the line for the dual meet, or just myself. You’ve got to keep that same mindset going out there,” Solomon said. 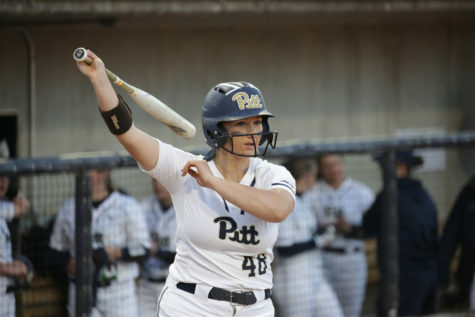 The Panthers will travel to Raleigh, North Carolina, next weekend in search of their first ACC win when they take on the North Carolina State Wolfpack at 7 p.m. Saturday, Feb. 3.